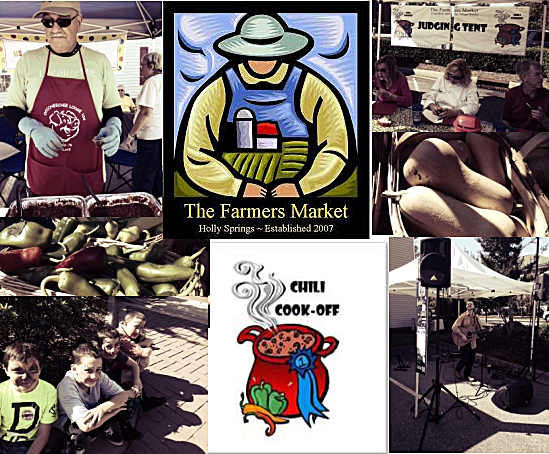 I was excited about attending the Holly Springs Chili Cook Off on Saturday October 11, 2014. Cooking chili brings back pleasant memories of my mom having a large pot of chili ready for us when we came home from school on a cold winter day or my father having his infamous hot chili simmering the stove when I got home from work. I can still taste it: the heat that gently burned you lips and spicy taste bursting in your mouth. My expectations were high.. I sampled the various chili at the cook off. I quickly discovered there is a regional difference in the preparation of chili. The chili in the Carolinas are made with kidney beans, some with chicken, some with ground beef, some with chunks of beef and one even containing black-eyed peas. The overall flavor is mild with very little heat. Most offered some type of hot sauce to increase the spice level, but it is not the same as preparing it hot. The winners were announced: Primrose School at Holly Grove & West Lake for the professionals…and Jabba-Q takes home BOTH the people’s choice award and the Judges #1 choice. Congratulations to the winners! It was a perfect day to end the season and I look forward to attending the Holly Springs Farmer’s Market next year – The Traveler.